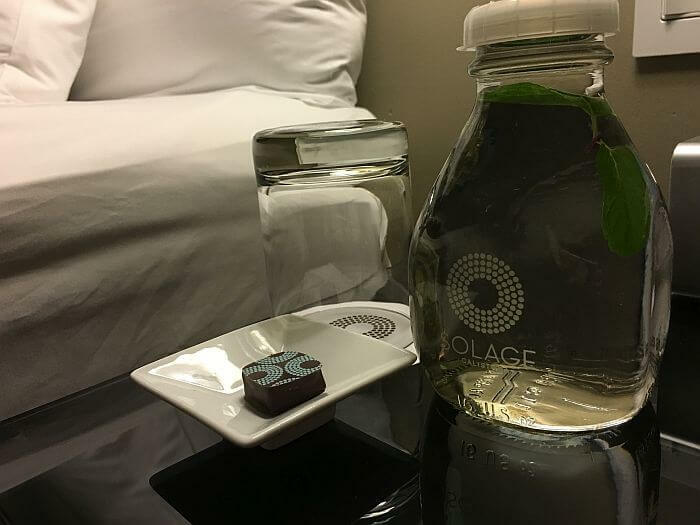 Solage Calistoga gives off a refreshing kind of vibe. Maybe it has something to do with its Northern California location – surrounded by mountains and grapevines, geography provides a pretty impressive backdrop. When you check in, take the staff up on an offer for a chai tea before a member of the staff hops on a bike and leads the way to your room. You’ll be in your car, so no worries about keeping up. Bikes are a part of the landscape at Solage Calistoga. 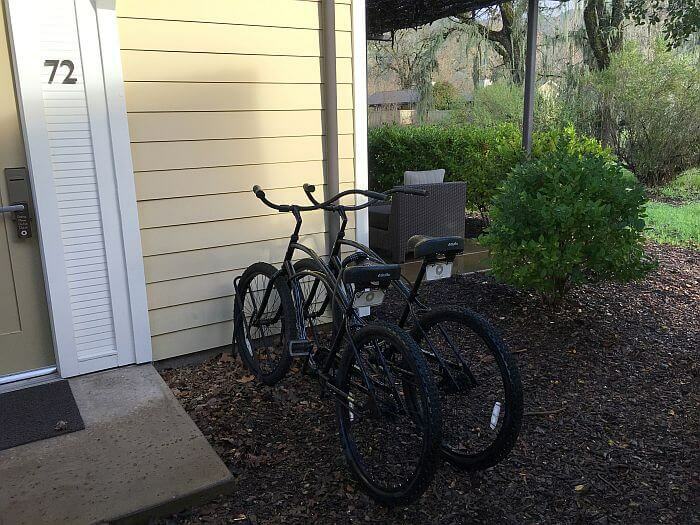 All of its 89 studios and suites come with a pair of cruiser bikes for guests to use during their stay. (The concierge can assist with kid rentals if needed.) Employees also use bikes to get around the resort and you might do a double-take the first time you see housekeeping on the move on one of their special three wheelers. The vacuum, broom, and assorted cleaning supplies all fit into the bike basket brilliantly. 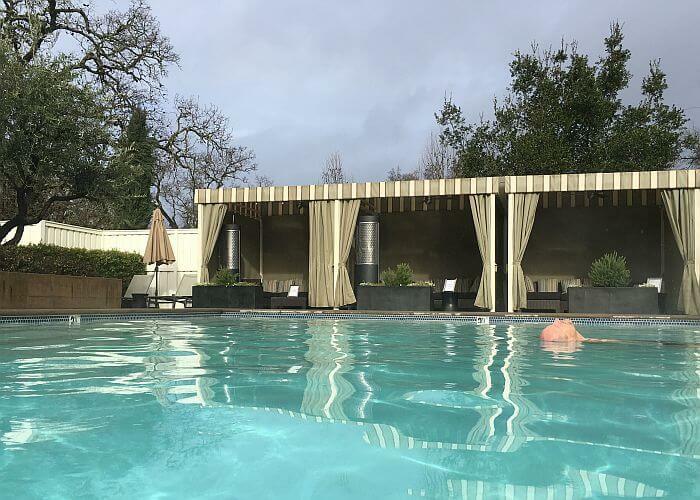 I stayed in a Calistoga King Studio in the Oak Grove area of the property, not far from the spa, gym and geothermal pools. The room was spacious with a king size bed, a sitting area with two chairs, a flip of a switch gas fireplace, desk, television and outdoor patio. The bathroom had an oversize walk-in shower, large tub and a toilet area with a door that closed for privacy. 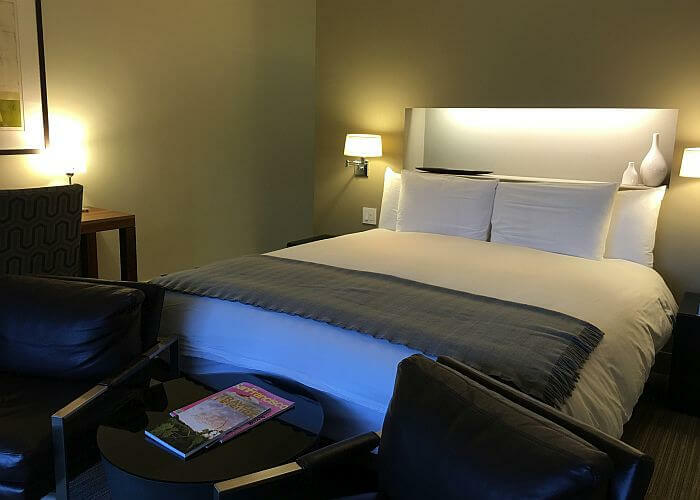 It would be easy to linger in your room, but Solage Calistoga offers a nice list of amenities to lure you out and about. The geothermal pools are nice day or night. They’re located steps away from the spa, fitness center and Wellness Studio where complimentary fitness classes are held daily. The 130-foot pool, framed by palm trees is a bit of a landmark in its own right. Complete with hot tub, swimmers must be 12 or older to go for a dip. A second, family pool is close by. There are also two regulation size bocce ball courts for folks who’d rather stay dry. 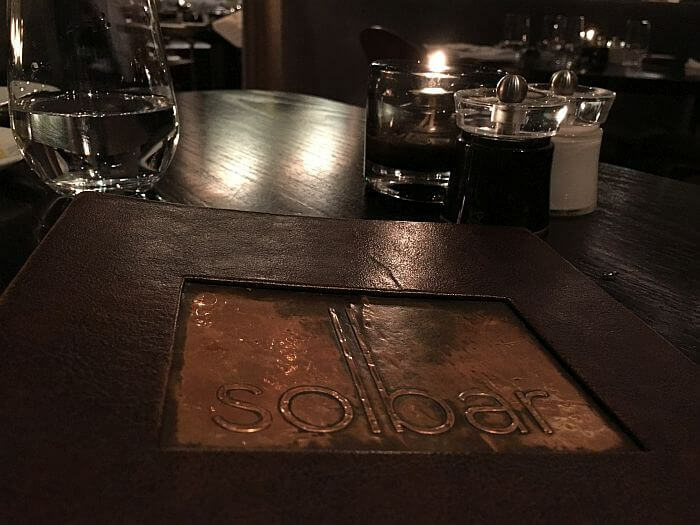 The on-site restaurant Solbar, serves Michelin-rated cuisine in a comfortable and relaxed atmosphere. The adjoining bar is just as welcoming as the main restaurant, offering a fun place to unwind, day or night. The bar food menu is as impressive as the drinks offered. It may be wine country, but the craft cocktails here are persuasive. Customers are a combination of guests and locals. Families are a common sight too. 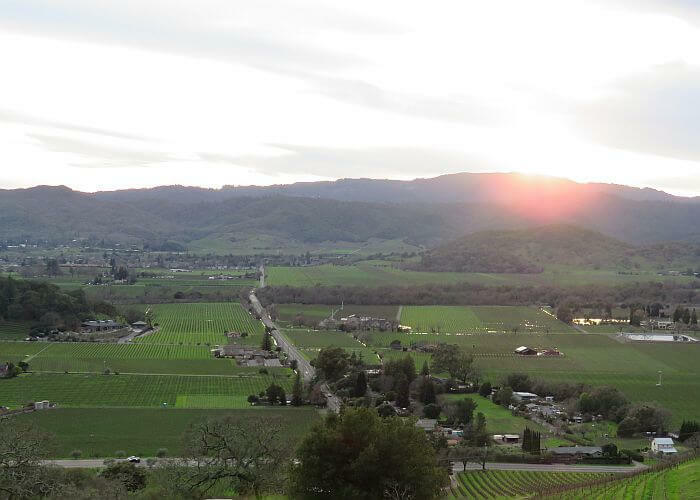 Downtown Calistoga is a quick and easy bike ride away. If you want to venture further, do it in style in one of Solage’s courtesy cars. The small fleet of Mercedes Benz are first come, first served and can be used up to four hours. Internet is complimentary and pets are welcome at the resort. Nightly turndown service comes with mint infused water and lavender chocolates. 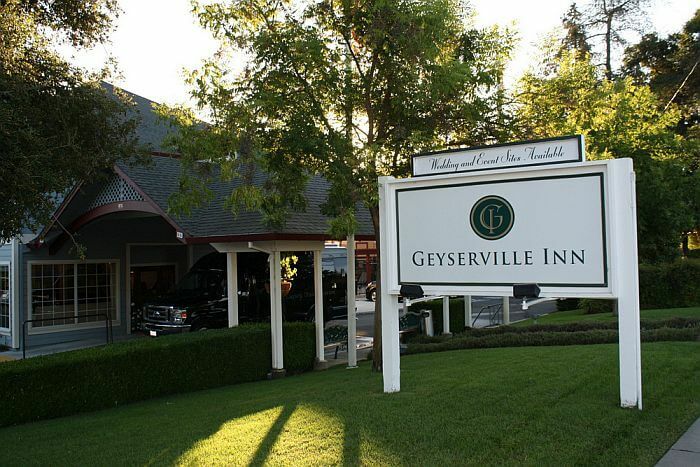 Rates for a Calistoga King Studio with a fireplace and bath tub range from $400 To $800 per night. Compare prices on Priceline or other booking sites. Review and photos by Dana Rebmann. She was a guest of Solage Calistoga, but as always her thoughts and opinions are her own.